Meet Piper, a sweet 14-year-old Goldendoodle. Like many older dogs, while generally healthy, Piper periodically experiences back and hip pain, and has a bit of trouble getting around. All this is managed with the support of a great veterinarian. When Dr. Louise Mesher of At Home Veterinary Services (AHVS), arrives at Piper’s home, she and her technician first do a thorough exam. Discussing any new issues and checking problem areas in her back and hips, the conversation naturally includes her quality of life, and treatment options to continue supporting her well-being. Mesher and her team treat the whole dog, considering quality of life in every step of the process. They first assess any medical concerns, then present a range of available treatments, detailing potential benefits and risks. While discussing a pet’s aging and disease is difficult, it is extremely important — potentially preventing the need to make rash or emotional decisions later. Sometimes preventive treatment is “just what the doctor ordered,” but other times no action is best. A vet who is willing to discuss all the angles — with impeccable skills and a loving heart — is among a pet parent’s most important ally in navigating the later years of their beloved pet’s life. Dr. Mesher is just that for many, and it shows: this year Mesher and her practice won 1st Place Top Dog Awards for Home/Medical Vet, End of Life Care, and Cat Medical; and was voted Top 10 for Veterinarian (Dr. Heather Dillon and Dr. Mesher), Veterinary Practice, Specialty Medical, and Holistic Practitioner. 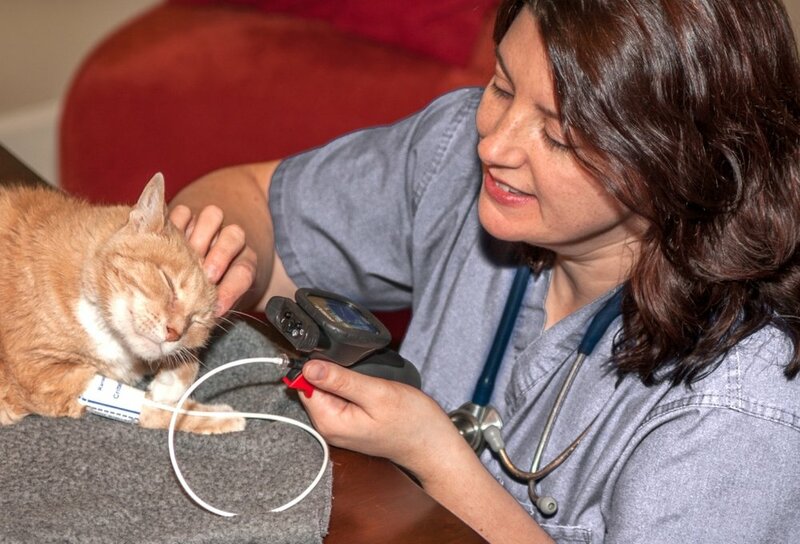 AHVS provides many other services, including preventive and hospice care. For many animals, having care at home minimizes stress and allows for a relaxed, calm visit. The ongoing care Piper receives includes acupuncture and therapeutic laser for back and hip pain. She also receives physical therapy (lucky dog!). Several members of the AHVS team are Certified Canine Rehabilitation Therapists, and they teach Piper and her owners therapeutic exercises for strength and flexibility. AHVS now offers these services to assist patients with long-term injuries and debility. The wonderful team of vets is ready for just about anything, and unfailingly provides care that honors the human-animal bond at every stage of a pet’s life. The October/November '17 (We Heart Our Aging Pets) issue is brought to you by At Home Veterinary Services. Posted in Feature, Health/Wellness, Pet Biz and tagged with Health, Holistic, Top Dog, Issue Sponsor, Treatments.